Indian-American cookbook author, Padma Lakshmi once observed that “we eat for our stomachs, but we hunger with our hearts.” Sometimes you might relate to that divide between what you want to eat and what you know you should eat to be at your very best. As we age, it can feel more challenging to meet adequate senior nutrition needs. They might be changed by a chronic health condition, by a medication you take, or simply because bodies change. Or memory conditions like Alzheimer’s and dementia can also impact some seniors’ ability to safely prepare meals the way they once did. Fortunately, retirement communities are a wonderful resource for senior nutrition and ways seniors can stay healthy by eating right. 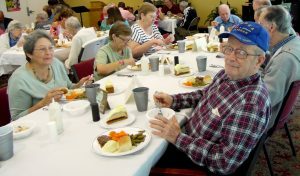 Riverwood serves three square meals a day that not only meet nutrition guidelines for seniors, but also give residents an opportunity to socialize over breakfast, lunch, and dinner. From waffles to stroganoff, our community enjoys the delicious foods prepared by our Dietary Staff and also the unique pleasure of eating, conversing, and spending time together. All without the stress and strain of shopping for and preparing food. Many of the nutrition guidelines recommended by agencies like the American Heart Association and World Health Organization are true for people of all ages. Limiting the intake of saturated fats, sodium, and sugar, while increasing consumption of non-starchy vegetables and fruits, lean protein, and whole grains is a workable strategy, ensuring you get as many macronutrients as possible. This nutrition plan can contribute to greater heart health, and can combat symptoms of chronic conditions like high blood pressure, high cholesterol, diabetes, and gout. While food isn’t the only component to staying in good health. You’ll want to discuss with your physician which diet works best for you, depending on any health conditions you might have, your weight, age, and what medications you take, among other factors. Some otherwise healthy foods, like tomatoes and eggplants can irritate Crohn’s Disease symptoms, for example, and high-potassium foods can exacerbate kidney disorders. But generally speaking, a nutritious diet will emphasize plenty of fibrous vegetables, healthy fats like olive oil and avocados, and lean proteins like seafood and white meat. That may not always mean cutting out, but cutting back on favorite foods like pizza, ribs, burgers, and rich desserts. You can still enjoy your favorites, albeit in smaller portions or less frequently. Instead, focus on filling up your plate with foods like broccoli, carrots, tomatoes, beans, chicken, and brown rice. Eating three well-proportioned meals a day isn’t just good for the body, it’s also a great opportunity to spend time with your friends and neighbors, converse, and swap stories. As Lakshimi notes, food is about so much more than the simple act of staying fed. The foods we eat tell the story of who we are and the communities of which we are part of. They can also tell the story of being part of a retirement home that takes a proactive approach to health.